rack before covering and drying in the fridge. I love using my crock pot for making my own chicken stock. It turns out great! I get a large pack of chicken leg quarters with the back. It’s usually one of the cheapest cuts. I’ve used a whole chicken before and it doesn’t turn out as well. The leg quarters make the best broth (and boullion cubes too, read on…) because the ratio of bones/gelatin to meat is higher. It’s the bones and gelatin that make this broth so nutritious. I add a whole head of garlic, sea salt, pepper and a dash of cayenne to my broth. Strain your broth, reduce by half and then using a 8″x8″ pyrex baking pan pour in your concentrated stock and let it cool to room temperature. When cool cover with a lid if you have one (if not use tin foil) and refrigerate for several hours (or overnight) until chilled. The broth should now be well congealed and have a firm, gelatin like texture. Scrape the fat off the top and reserve if you plan on using it for frying (or re-seasoning your cast iron). Cut the gelled broth into cubes. 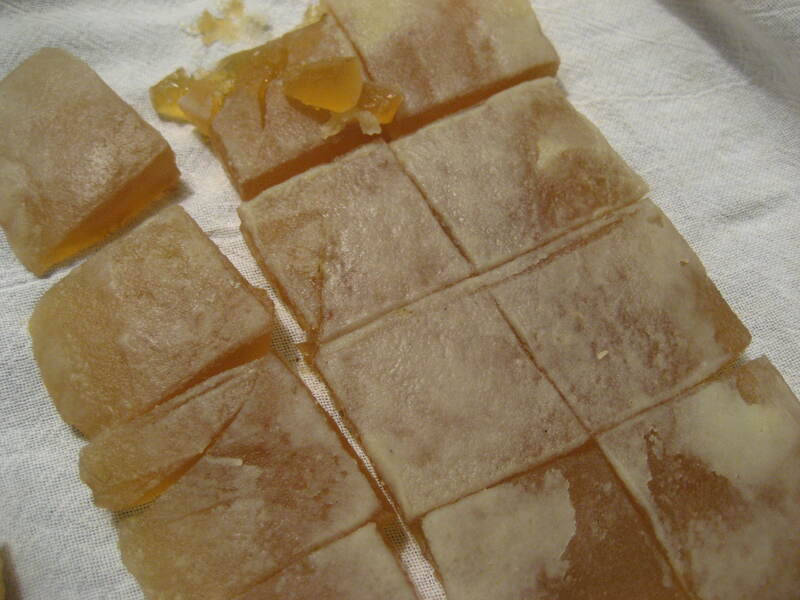 Next we will turn them into preserved boullion cubes by preparing a drying rack for them. 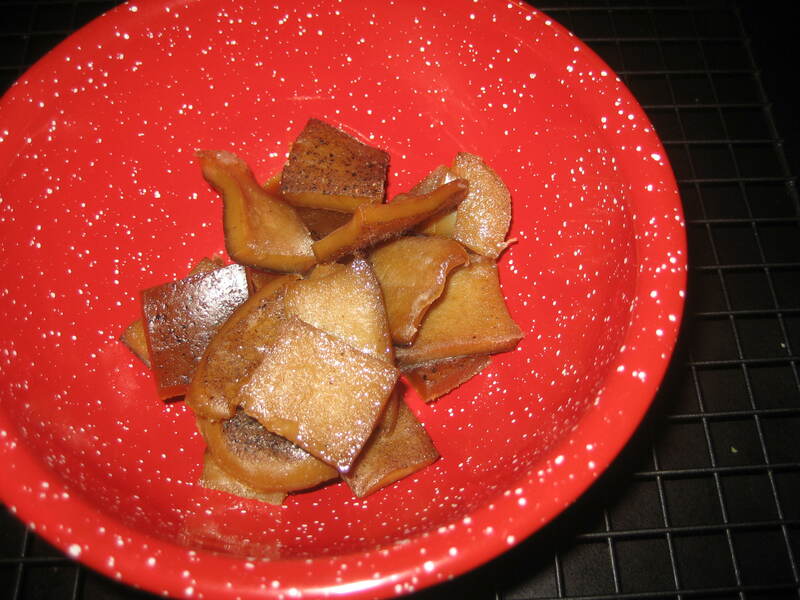 Cubes after they have dried. Note: This same technique can also be used for beef or any bone broth. I’m sure that my grandmother grew up with real maple syrup on her pancakes. My kids and I like the real thing too. But, I’ve always had trouble with it coming out of the bottle too fast so that you get too much. And who wants to waste such a yummy (and expensive) topping? Well, I found a good solution. 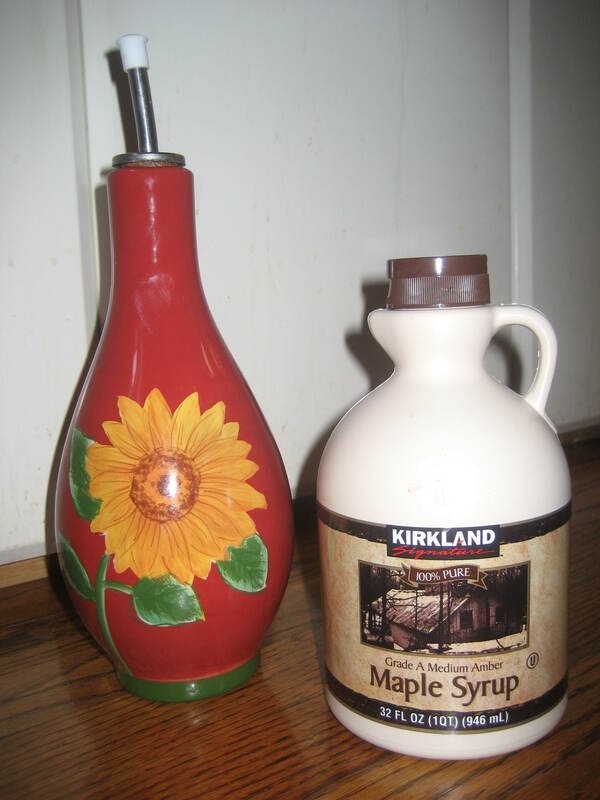 Find a pretty oil bottle and fill with syrup. It comes out in a nice, steady stream so that you get just the right amount. I usually wash out the bottle and spout with hot water every other time that I fill it up as maple syrup will go bad after a while. Pancakes anyone? In Maggie’s day sourdough starter was a kitchen staple right alongside salt pork and lard. Boughten yeast often wasn’t available so you did what you had to – you made your own. The fact that you can mix up a little flour and a little water and end up with a mixture of wild yeasts that will leaven your bread amazes me. If you know someone that has a sourdough starter, get some from them. I’m sure they would be glad to share. Otherwise, it’s not hard to make your own. To start your own mix 1 cup of whole wheat with one cup of water in a glass jar or bowl and stir. Filtered water is best to start with as it will not inhibit the growth of the yeasts that are naturally in the flour and air. 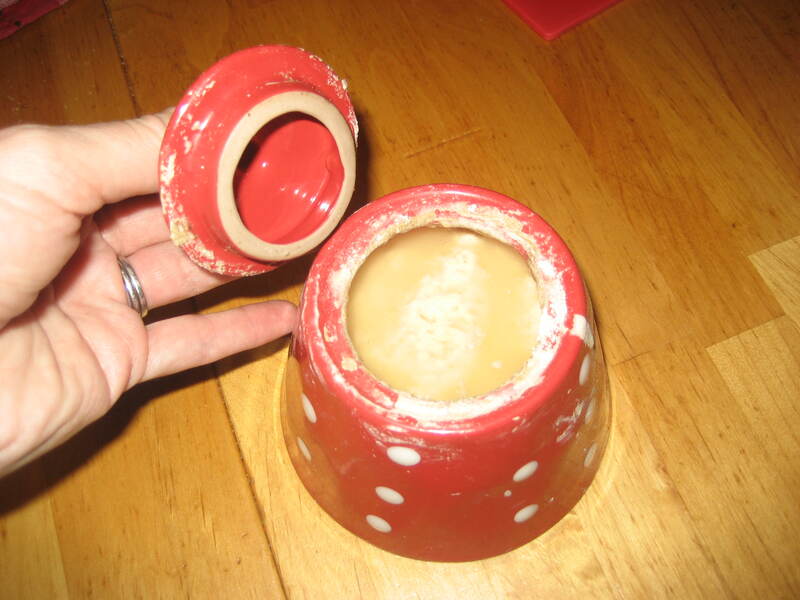 If you don’t have water filter, then set a glass of water out overnight or for 24 hours to let the chlorine evaporate. 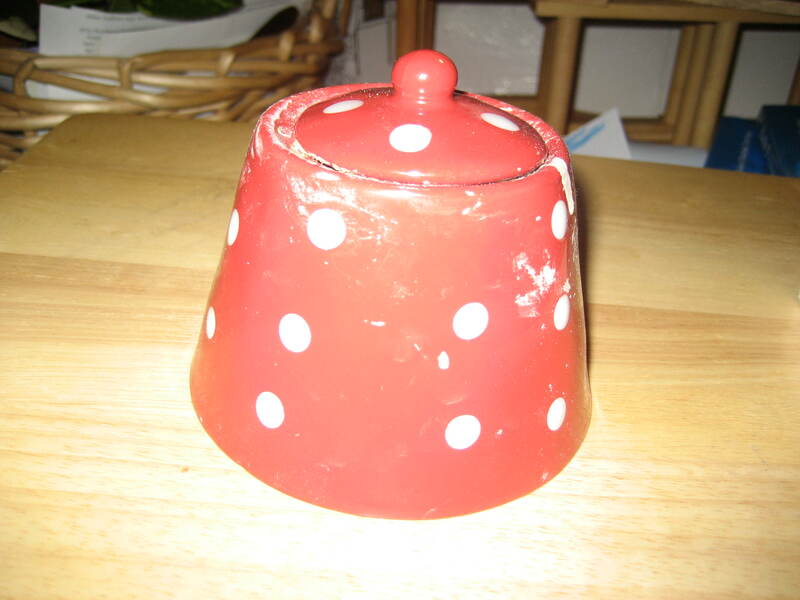 Sit your flour and water mixture it in a warm place on your counter where you will see it and think of it often. When you do see it, give it a stir. Stirring several times a day is important to the success of your starter at this point. After 3-5 days you should begin to see bubbles in your starter before you stir it. It could more or less time for this to develop depending on the temperature of your kitchen, so bubble don’t develop as soon as you expect, don’t give up. Just keep on stirring several times a day until you see them form. If your mixture takes on a very foul odor, develops mold or changes color to anything other than what looks like pancake batter, then throw it out and try again. Once bubbles have formed though the starter is active. Once you have an active starter, you need to feed it daily to keep it healthy. I like to feed mine 1 tbl. of flour and 1 tbl. of water every day, but you can really feed it any amount of equal parts flout and water depending on how much starter you want it to make and how soon you need it. (Note: filtered water isn’t as important in these daily feedings as it is when you are first beginning and trying to activate the yeasts.) If you come to a period of time where you find that you can’t feed your regularly, then simply refrigerate it. When you take it out to use it again give it a good stir and let it sit out on the counter overnight to warm up and wake up. Then give it a good feeding. I would feed it double whatever you would normally give it for a daily feeding. Let it sit for 24 hours and resume regular feedings after that. Whenever you are ready to use your starter, simply remove the amount you want from your container. You can use all the starter. There will be enough in the bottom and sides of the jar to get it going again. Then give it a double feeding and feed regularly after that. If you forget to feed your starter or find that the starter has grown too sour for your liking simply pour off some of the liquid that rises to the top in between feedings, give it a double feeding and you should be good to to go. I forgot to feed mine for two days one time and I was able to perk it back up. So, all will not be lost if you neglect it for a day or maybe two. Now that you have your starter, try your hand at some sourdough bread, sourdough croutons, or sourdough buckwheat pancakes. Yum! My starter after sitting for 24 hours. The liquid has separated and it’s ready for a feeding and a good stir. Trying this right now with some gelatin/stock from turkey legs I just slow cooked–thanks, I’m excited! One question – what is the garlic you mention? Did you perhaps cook the chicken legs in some garlic? Yes. I cook my chicken stock with garlic cloves, sea salt, pepper and a dash of cayenne. Do the cubes have to be in the Fridge to dehydrate? I made some broth after Thanksgiving and have them my cold garage, and they are still gelatinous, not dried at all, now 2 weeks later? And since they didn’t dehydrate fast enough–do I have to be concerned about spoilage at this point? There is no mold or slime present. It can take a while for them to dehydrate depending on how thick they are and how much you reduced the stock which would determine how much liquid is left in them. I would think your garage would be cold enough. The key is not to keep them in a container. The air needs to be able to circulate to dry them out. Cover with a tea towel at most and give them more time. I think they will be fine.